Recycling has to become more organised if the world wants to manage waste seriously, a Wellington entrepreneur says. Method Recycling co-founder Steven Korner said recycling had become complicated as every country and even city, recycled differently. 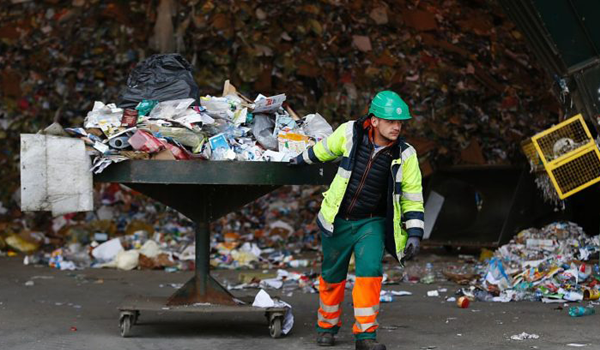 Korner said there needed to be a structured and organised system to recycle efficiently as often glass, plastic and cardboard products are not seperated. “We’ve got two or three options, but we’re going to need more categories to recycle because not all components of a product can be recycled,” he said. Korner, whose company has become popular for its aesthetically-focused recycling bins designed for open-plan office spaces, said the next step for the business was to form partnerships with companies that created products that could be entirely recycled, therefore feeding into the circular economy. In a circular economy the life cycle of all materials is maximised, usage optimised and at the end of life all materials are fully reused. For instance, recycling standard takeaway coffee cups can be difficult as they are made from paper and lined with a plastic coating. Separating the two materials can be tricky for most recycling facilities. The Packaging Forum estimates that 295 million plastic cups (including compostable coffee cups) go to landfills here every year. But plant-based packaging company Ecoware has found a solution for this problem. Its director Alex Magaraggia​ said technology and innovation played a key role in the future of waste management and were the cornerstones of its business development, creating a product made completely out of compostable material rather than traditional oil-based plastic packaging. “The innovation of using packaging made from plants means we don’t need to use scarce fossil-fuels anymore, we can significantly reduce plastic waste, and we can help New Zealand businesses be a part of the circular economy, which is where we should all be heading,” he said. “In today’s world, people want a product that performs well, is affordably priced, but also sustainable. The success of our business has been based on fulfilling these three factors across all of our packaging. ​Everyone from cafes and food trucks, to takeaway joints and the Beehive use the company’s products. Both Ecoware and Method Recycling were listed on last year’s Deloitte Fast 50 index which recognises the country’s fastest growing companies. Magaraggia said technology will also making recycling cheaper. “We keep overhead costs down through operating lean, reminding ourselves to invest in opportunities that matter rather than having bloated budgets across the board, and always investing in technology that can streamline our processes or help us be more efficient.